Thousands of Santas have turned Glasgow red and white to raise money for a cancer charity. Runners of all ages took part in the annual Santa Dash 5k, starting and finishing in George Square. A record 8,500 crowd braved sub-zero temperatures for the event, which this year was in aid of the Beatson Cancer Charity. 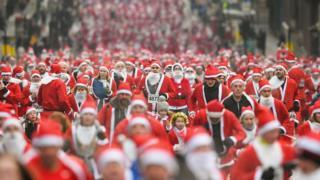 Since the inaugural race in 2006 the Glasgow Santa Dash has raised more than £250,000 for various charities. This year's race was started by Glasgow's Lord Provost Eva Bolander. She said: "Seeing thousands upon thousands of Santas running through the streets of Glasgow is spectacular and unforgettable. "That so many take the time to come along and support charities as we head towards Christmas shows just how generous Glasgow is. "I hope everyone who ran the race and came along, and particularly all the volunteers, had a wonderful time." Maisie Hamilton, Beatson Cancer Charity's community fundraising manager, said: "Beatson Cancer Charity is delighted and overwhelmed at the number of people that signed up to this year's Santa Dash. "It was such a fantastic sight in an incredible city. Thank you so much to you all, we hope you had a great time."